Good news for consumers over in Europe; Acer will be soon launching its new Aspire 5745P Calpella laptop. The Aspire 5745P Calpella notebook works on Intel’s 2010 platform. It comes with an extraordinary multi-touch panel. Acer, which has slipped to number three as a supplier of PCs, will be releasing its new notebook with multi-touch input. It works on an Intel Core i5-450M central processing unit. There’s enough memory present in the laptop in the likes of a 4GB of RAM. Acer has commented that this notebook will work well and easily as it is the separate graphics card that is in charge of handling most multimedia and other graphically-loaded tasks. Acer has also chosen the NVIDIA GeForce GT 330M that comes with a 1GB of memory. The screen measures 15.6 inches and comes with a native resolution of 1,366 x 768 pixels. With a resolution as such, it means that playing and viewing HD videos won’t be a problem. The Acer 5745P Calpella notebook comes with a 500 GB HDD. It also features a Blu-ray drive. Not forgetting an array of connectivity and I/O options. There’s a 5-in-1 card reader on the laptop. Other features include Gigabit Ethernet, 802.11 b/g/n WiFi and a HDMI output. The Acer 5745P Calpella laptop will be sold in Europe at the price of 999 Euro. Good news for all who love a good leak! An unannounced Acer laptop has been spotted in the wild. What’s more? The device comes with dual screens that measure 15-inch. More likely, the display screen will be used as the display while the other screen, of the same size, will be used as a replacement for the keyboard and trackpad. It might seem that this not yet seen Acer laptop is huge. Well, it could be if it is carrying dual 15-inch screens. As usual, this leak too comes with the least information possible. The online community has been racking up their brains to decide the device’s features based on the pictures leaked alone. Basically, the Acer dual screen laptop has the same concept as the Microsoft Courier and theToshiba Libretto W100 whereby the latter has only 7-inch screens. Experts are saying that this Acer laptop with dual screens will be released late next year. Looks like we will have to wait a long time for the full package! 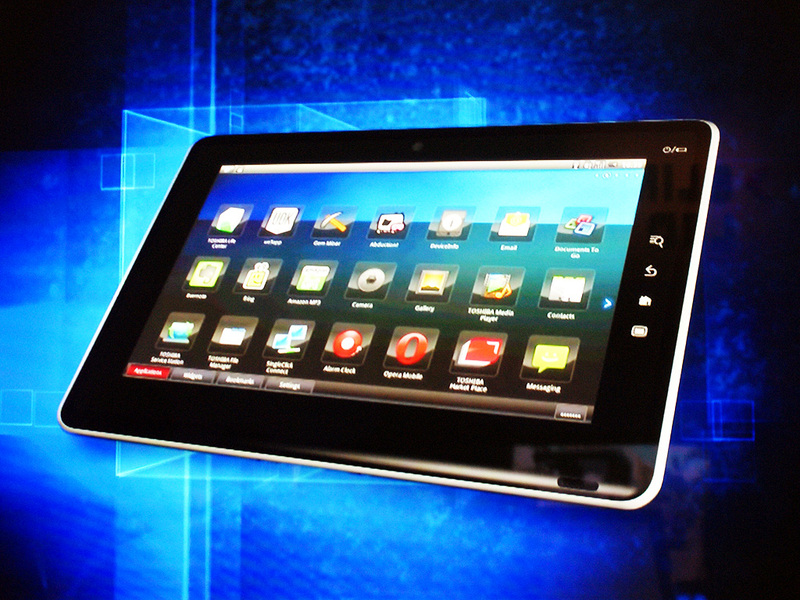 The new Android based media tablet from Toshiba, the Folio 100, comes with many interesting features. Whether or not these features can be the main points to heavily compete with the AppleiPad is yet to be seen. Nevertheless, let’s see what the main attractions of the Folio 100 are. Like we all know, it is a Mobile Broadband (3G) ready version and comes ready with several Android applications. The Toshiba Folio 100 comes with several features that will help keep its users on the move. There are Opera Mobile (web browser), FBReader (e-book reader), Document To Go (office suite), Evernote (notes), Adobe Flash 10.1 and Fring. There’s also a webcam on the tablet that comes with an app which allows the users to conduct video calls to their friends and family. The Toshiba Folio 100 also comes with the Toshiba Market Place, which is a service from Toshiba that offers easy access to various download choices for multimedia content, services and apps. Other features include the Music Place that offers easy access to music catalogues. The Folio 100 comes with 16GB on-board storage and with a SD memory card slot. The Toshiba Folio 100 Android tablet will be released in October.